A strategic plan provides a roadmap for where a hospital or health system will focus its efforts and resources. The plan must generate financial results required for long term success. Therefore, financial implications should be integrated throughout the planning process to focus on the initiatives that will have the most profound positive impact on the organization. It is essential that finance leadership is actively engaged in strategic planning from the very beginning of the process. This goes beyond just including them on the planning committee. It needs to be clear to all that finance’s role is critical to the plan. This will ensure both prudent stewardship of the organization’s resources, and selection of strategies and initiatives that are consistent with its financial capabilities and future performance requirements. The seven steps to ensuring financially sound planning nest under three of the four major tasks of strategic planning. An environmental assessment, one of the first steps in the planning process, will assess both internal and external factors impacting the organization. A deep dive into financial position and financial performance is vital. All stakeholders involved in decisions about how resources will be allocated need to have a shared understanding of the current state of the organization’s finances and its capacity to fund new initiatives. This should include performance compared to key industry benchmarks, rating agency criteria, and comparison to local competitors. A base case is needed as a starting point for understanding how proposed strategies may impact financial performance. This base case, typically looking ahead at least five years, will provide insight into the expected financial outlook of the organization without any strategic actions, given current trends and expected changes in utilization, reimbursement, expenses, and other factors. With a solid base case, the incremental impact of proposed strategies and initiatives can be properly evaluated in relation both to that base case and to each other. 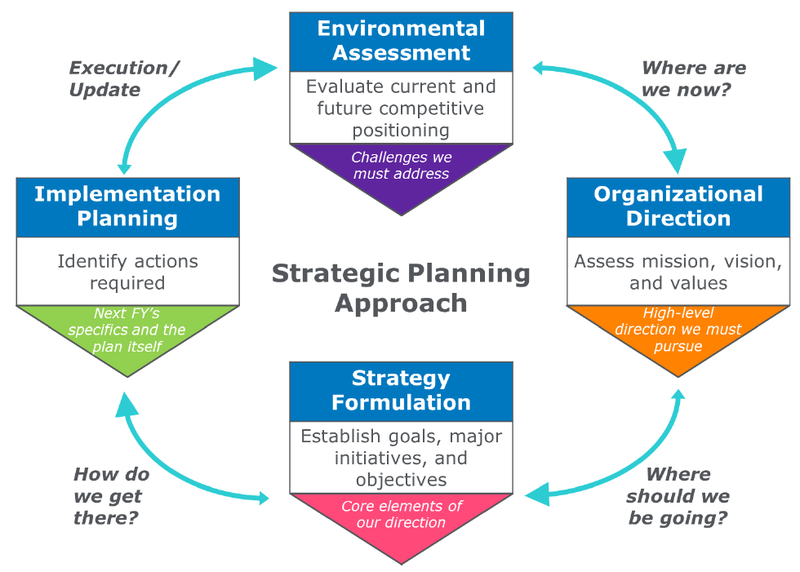 During the setting of Strategic Direction, an organization will re-evaluate its mission (why the organization exists) and vision (what the organization seeks to achieve), and values. This re-evaluation may touch on financial issues – for example the values may include stewardship and vision may address financial sustainability – but no specific financial task must necessarily be completed as part of this task. During Strategy Formulation, finance reemerges as a critical factor. Organizations often need to incorporate financial performance metrics into goals related to growth, efficiency, or population health strategies. With goals established, the next step in Strategy Formulation is to identify the specific initiatives that will be pursued to achieve the goals. Once a short list of potential initiatives is vetted and agreed upon, a financial impact analysis should be performed for each strategic initiative. This should include identification of capital resource requirements as well as high-level impact on revenues and expenses typically for five years or more as strategic initiatives often take time to ramp up. Modelling several scenarios for each proposed initiative will test the potential range of financial impact under various conditions. While one initiative may provide the most positive impact under current conditions, it may look less favorable under other potential conditions; other initiatives may bring stable results under varying conditions. By modeling alternative scenarios, the planning team will develop an understanding of each strategy’s sensitivity to changes in volume and other factors. This will allow the planning team to pursue the most appropriate strategies given the organization’s goals and risk tolerance. Force your organization to make the tough decisions. If the combined impact of the initiatives does not achieve the required financial performance, go back and try again. This is the critical moment for finance leadership to use the planning process to achieve the required results. A strategic plan developed within the financial constraints of the organization should be ambitious yet feasible. The Implementation phase of strategic planning is often undervalued and overlooked. Finance can play a critical role in ensuring effective implementation. First, finance is responsible for integrating initiatives into operating budgets and committing resources. Then finance must track results and incorporate the selected financial metrics into the periodic review of the strategic plan. This helps to determine whether each initiative is on track and whether the overall desired result is being achieved. As the strategic plan is reviewed annually, initiatives should be refined, with appropriate adjustments to budgets.